Camo clothes, check. Rifle, check. Ammo, check. Spotting scope… wait! Were you about to go hunting without your spotting scope? Well, you should have known by now that a good spotting scope can make a huge difference. Whether you’re an avid hunter, birdwatcher, or simply want to look in amazement at those huge bullet holes you’ve just made in a couple of beer cans, you really need one. But hey, you say, I don’t know which one is the best spotting scope! Don’t worry, that’s exactly why we are here. Not only are we going to explain the basics when it comes to terminology, features, everyday use and maintenance, but we’ve also compiled a list of the best spotting scopes money can get. The models we’ve chosen to review will blow your mind. Besides being able to provide a crystal clear, the high-resolution image at an outstanding range, these scopes are virtually tanks when it comes to sturdiness! The best of the best, as a professional like you deserve. Forget about blurry images, fragile optics, and foggy lenses, and say hello to the most advanced optical devices guaranteed to bring you the best results. A spotting scope is practically a small telescope modified in such a way that it can be used by day. There are a couple of main differences between those two. A spotting scope produces an upright image, and a telescope often produces a reversed or an upside down image. Looking through a telescope and seeing a reversed image is not a problem when viewing stars or other celestial objects, but it certainly isn’t practical when you’re trying to hunt or watch birds or other wildlife. Spotting scopes have to be smaller and more portable as for their difference in use. 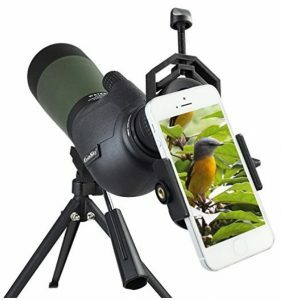 Third, a spotting scope has a lower magnification capability than a telescope, as the atmospheric conditions present at daytime don’t allow greater magnification unlike the telescope at night. Finally, most spotting scopes feature water/fog- proof design, something that you can rarely find in an astronomical telescope. They are widely used for hunting, birding, surveillance, as well as for viewing wildlife. You will also find them at any shooting range, as they are quite useful for viewing targets and assessing shots. Under the right conditions, you can even use a scope to get a better view of some interesting things in the night sky. Some models are also capable of being strapped with a camera. That means that you can snap amazing photos at long distances. Now that you know what spotting scopes are, it’s time to take a look at some basic features. In order to choose an appropriate scope to suit your needs, you need to understand some key terminology. When it comes to body style, there are two main types. A straight body scope, and an angled body scope. A straight body spotting scope is easier to use when viewing from an elevated point. An angled body design is more comfortable to use for viewing from the window of a car, as well as for looking up at your target, or when lying flat on the ground. 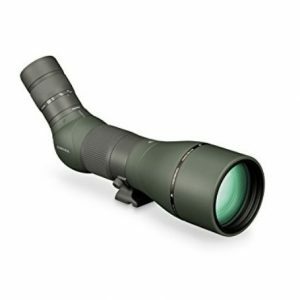 The best option for a spotting scope lens would, of course, be a high quality one, made of high-performance glass. If you can’t distinguish such features, your best bet is to go for quality over size. A larger lens made out of poor quality materials will result in a so-so view, whereas a smaller lens of the optimal quality will be visibly better. Magnification is the main reason for using a scope rather than traditional binoculars. Spotting scopes provide magnification of 30x -40x, definitely more than a pair of binoculars. Expect a loss of image quality at higher magnifications, as well as a bigger price as the loss of quality is smaller with the increase of magnification. The lens can also be fully, multi, or fully multi-coated. Each coating improves the quality of the image. Two main types of prisms used in spotting scopes are Roof and Porro prisms. The roof prism is compact but can lead to the lack of some features as interchangeable eyepieces. The Porro prism is the least expensive, thus making it the most common. This is the nearest distance you can view with a spotting scope. The norm is a minimum of 20 feet and is important for viewing intricate details on, for example, birds. As we mentioned earlier, most spotting scopes are designed to be water and fogproof, in order to protect the delicate insides, keeping the scope in optimal condition for a longer period of time. This scope is manufactured by the professionals at Gosky Optics, who have made a name for themselves over the years by supplying their more than satisfied customers with high quality and precision made optics and accessories. Being regarded as a high quality, high performance, and overall affordable spotting scope, the 20-60X 80 Porro Prism is surely capable of delivering great action. It boasts a magnification range of 20x – 60x, and a field of view of 39 – 19m / 1000 distance. An eyepiece measuring 20mm in diameter and an objective lens 80mm in diameter are guaranteed to get you a great viewing experience. Also present is the above- average dynamic focus system allowing you to easily zoom in and out on distant targets. Coupled with high precision optics, the scope is more than capable of delivering bright, clear view and images in all circumstances. With its compact and lightweight design, the scope will easily fit in with the rest of your gear, and you won’t even feel it’s there until you need it. The only con would be the metal tripod being cheaply made, and it simply looks low quality. Although it performs well enough, it looks like it could be easily broken if stepped on with enough force, or bent too much. As you have surely seen from the review above, the Gosky 20-60X 80 Porro Prism Spotting Scope is equipped with all of the important features and characteristics a good scope should have. You will find yourself having a great viewing experience in no time if you decide to buy this one. This one could be the spotting scope for target shooting. 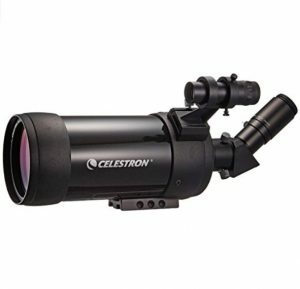 Number two on our spotting scope review list is the Celestron 52268 C90 Mak Spotting Scope. Coming from Celestron, one of the most reputable companies in the business, it comes with a variety of great features and a sleek design which the users will find more than satisfactory. If you’re searching for great value on the scope market, definitely consider the Celestron 52268 C90 Mak spotting scope, as it may well be the best spotting scope for the money. This one is a Maksutov scope with 90mm diameter and optics which are, of course,multi-coated. Back in the 70s, when this model was first released, it was fairly expensive, though justifiably, because even back then it packed a punch. Although it has since the been completely redesigned, by keeping the basics the same as its older brother, the Celestron 52268 C90 still manages to be one of the spotting scopes for birding, target shooting, and a bit more. Bang for the buck –by choosing the Celestron C90 Mak you surely hit the jackpot, with its outstanding features being almost a steal for its price. It will outlive you – its sturdy design will without a doubt withstand any wear and tear you throw at it. Compact design, ideal for traveling, despite the 2kg weight. 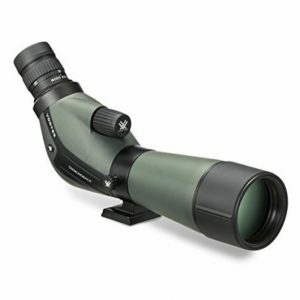 Accessories – 32mm eyepiece and an erect image finder scope, plus an additional erect image diagonal. • No waterproof features – Although all the seals on this model are top notch, you still have to be careful when handling the Celestron 52268 C90 in wet conditions. This may be a dealbreaker for some users. All in all, a real gem in the scope business. 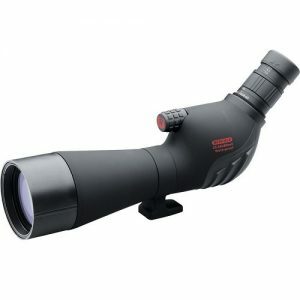 If you need a scope for animal watching or test range shooting, do consider getting this one. If you need a scope for astronomical purposes, don’t think, get this model while you still can!As this model is quite affordable, you can without a doubt say that it’s the best budget spotting scope you can get. Moving on to number 3 on our spotting scope review, we find the Redfield 114651 Rampage 20-60x80mm Angled Spotting Scope. Manufactured and designed by Redfield, one of the child companies of Leupold, these scopes are manufactured in China. Don’t let that fact discourage you, as their scopes are in most cases, pretty close to those made exclusively by Leupold. The Redfield Rampage 20-60x80mm Angled Spotting Scope hosts a sturdy yet light polycarbonate casing. This means that the scope won’t be a hassle to carry around for the whole day if needed. The body of the scope is covered with rubber armor, and neatly placed textured grip pads, ensuring both great grip and durability from accidental scratches and falls. As well as both the previously mentioned scopes, this one is also featuring an angled body. Also included in the package is a tripod. However, the locking screw is poorly made and may give way under the weight, thus making the whole scope swivel. We advise considering on getting a larger tripod just in case. Fantastic image quality, crisp and clear even in bad weather and lighting conditions. Top notch fogproof and waterproof design. All the necessary accessories included. The tripod is as previously mentioned a bit shaky and doesn’t feel premium. The view through case may limit motion at certain viewing angles. All things said, the Redfield Rampage 20-60x80mm Angled Spotting Scope is a mix of great design and features, packed into a lightweight polycarbonate casing, making it your ideal spotting scope primarily for shooting or hunting. Considering all the great features you get, it may just be the spotting scope in budget. Number 4 on our spotting scope review list is the Vortex Optics Diamondback Spotting Scope. Vortex Optics is a brand name which has, for the last 15 years, represented above average quality products at affordable prices. They are also famous for their lifetime warranties for certain products they sell. The Vortex Optics Diamondback Spotting Scope features an angled body design. The Diamondback is protected with a thick layer of rubber armor. Obviously, durability is no issue here. When your Vortex Optics Diamondback Spotting Scope arrives, you won’t find a tripod in the package.The tripod ring rotates, making the adjustments for your desired angle of view a breeze. What you do get in the package is a soft carrying case, to help you with organizing your hunting trips better, as well as a cleaning cloth. Pros and cons of the Vortex Optics Diamondback Spotting Scope come as no surprise if you took your time reading the full review above. Most of the cons below are focused on minor details with the exception of the range of the scope. Nearly impossible to produce a sharp and crisp image at maximum magnification. Packaged poorly, prone to damage while in transport. Practically useless for spotting objects beyond 100 yards. This scope is one of the most durable ones you can find. The lenses are sealed with O-rings, as to keep any water out, and the optics chamber is charged with Argon, as to prevent any fogging. Described as scratch resistant and ultra hard, no doubt that it will do its best protecting the fine optics and aerodynamic body. In case you want to use your scope with a camera, don’t fret as the Razor HD has got you covered. Just remove the eyepiece and snap on a camera adapter, which unfortunately you don’t get included in the package. What you will find in the box, is the scope itself, both eyepiece and objective covers for that dust and scratch protection, and a view – through the case. No tripod is included. Considering the excellent optics, fine controls, and overall beautiful design, the pros and cons list is fairly concise. Both coarse and fine focus controls. On the heavier side, at double the weight of the Diamondback. Carrying case not included in the package. There is only one more thing to mention about the Razor HD. The price. As we’ve seen so far, most scopes reviewed are in a range of 200 to 500$, this scope takes it a step further. But hear me out, as the high price tag is in fact justified. The Vortex 27-60×85 Razor HD Spotting Scope isn’t something an amateur or a beginner gets. No matter what you intend on using a scope for, the Razor HD is a carefully put together piece of professional equipment. If your scope of choice is a sturdy, premium one, that delivers vivid, and crystal clear images, go for this one. Why Do I Need The Spotting Scope? So far we have covered some basics you should know about different parts and general characteristics of different spotting scopes. We’ve also seen a good list of 5 different scopes and their main features. But maybe you’re asking yourself, why do I need a spotting scope? Birdwatching, also known as Birding, is a great way to spend some quality outdoor time. Sure, you could just go out and hope to spot some interesting species, but in order to get the full experience, you will need a decent spotting scope. Whether a bird is in flight, on a tree, or like eagles, on high cliffs, you won’t be able to do any viewing without some gear. And a spotting scope is an essential part of gear any bird enthusiast must have. Unless your plan is to chase deer, boars or other game in the woods with a spear in your hands, you need a spotting scope. A scope on your rifle will help make your aim as good as it gets, but using it to spot your target is a real hassle. With a good spotting scope, you will have a much larger field of view and probably a better magnification range. Having a scope with you will surely have a positive impact on your hunting as it’s practically as important as a good rifle or any other piece of equipment. Similar to hunting, in order to check the precision of your shots, and to locate your target in the first place, you need a spotting scope. Sure, you could use a pair of binoculars, but we’ve already covered the downside of using one. Optimal shots and overall ease of use make spotting scopes a must-have piece of gear when going target shooting. Sure, a good telescope makes stargazing easier than a spotting scope, but for a beginner or amateur astronomer, a scope can be a great first step. A spotting scope is certainly handy if you have a large property, like a ranch for example. Instead of walking or driving to make sure everything is alright with your cattle, simply take a peek with a scope and save some time. Spotting intruders is also easier with a powerful instrument like a good scope. Now that you’re acquainted with spotting scopes, it’s time to lay out the basic stuff you should consider when choosing one. Although basic characteristic of most spotting scopes don’t make a huge difference when it comes to different purposes you may use the scope for, it’s good to know in advance the main purpose you need a scope for. You should know the range of magnification you’ll be using the scope for, in order to avoid additional cost you may not need. That means you don’t need a too powerful scope if you only plan on using it for viewing objects at smaller distances. Bigger spotting scopes may be more powerful and provide better images and viewing experience. However, if you plan on moving a lot, and need a more compact and mobile scope, consider the weight and size. Chances are that you won’t be carrying just the scope with you. Equipment can get heavy and bulky fast, and the last thing you need is a back pain after a long day of hiking, hunting, or watching wildlife. A big scope is no problem if you plan on mounting it in a fixed position, whether that may be the porch of your house or your backyard for those late night star viewing sessions. We have covered the difference in body styles of scopes above, but it won’t hurt to repeat it. Although, your neck may hurt if you don’t choose the appropriate body style when buying one. Think about the settings in which you’ll be using the scope the most, and choose accordingly. If you don’t plan on using a scope every day, or you’re just getting into a hobby that requires one, you don’t need crazy high image quality. The same goes for magnification range, focus, and other optics- related specifications. As optics quality are the main difference between different scopes, they are the main reason that makes a huge difference in price. It’s better to buy an entry-level scope at first, and gradually improve the quality over time. That way you will learn more about certain things that suit you better, and develop a personal feel when using a scope, and know better what to seek when buying a new scope. You finally bought your first, or your next spotting scope. You read the manual if you found it necessary, but don’t really know how to take care of the scope. Here are some basic things you should know about keeping your scope in optimal condition, as well as making sure it lasts for a long time. Sure, the manufacturer may state that their scope is unbreakable, but that doesn’t mean you shouldn’t be careful when you use it. Optics are fragile, and can and will break if not handled with care. All those protective layers don’t help much if you don’t treat your scope with heed. Once you’ve removed the caps from the eyepiece and the objective lens, be careful as not to scratch it or damage it in any way. Remember that dust and abrasive particles are a spotting scope’s worst enemies. Even though your scope is water and fogproof, don’t expect it to work perfectly in extreme conditions. Fog may appear if you don’t operate the scope with caution. Tight seals on the outside can keep water out, but not all of it if used continuously in wet or moist places. Make sure to wipe any excess water or vapor condensation that may appear on the outside, and use all of the protective accessories included with your scope at all times to ensure optimal protection. Maintenance is way cheaper than having to replace your scope. Use a can of compressed air, a damp cloth, and a brush to clean the outside of the scope and remove any excess dirt. A microfiber cloth is great for removing fingerprints and oily residues from both the eyepiece and objective lens. However, pay close attention and be sure not to apply any extraneous pressure, as to avoid unintentional scratching of the lens. Storing your scope in an adequate place is as important as being careful when using it. Always double check that all safety caps are on when you’re done using it. Any protective case provided should be used when storing your scope. You should store your scope in a cool, dry area with the rest of your equipment in order to prevent any damage from moisture. By following all the steps mentioned above, your scope will be kept in optimal condition for a long period of time. Thank you for following us on our journey through the world of spotting scopes. A good spotting scope is as worth as a good camera or rifle, whichever you find yourself using a scope with. We hope that this best spotting scope review helped you in choosing one that will suit your needs.